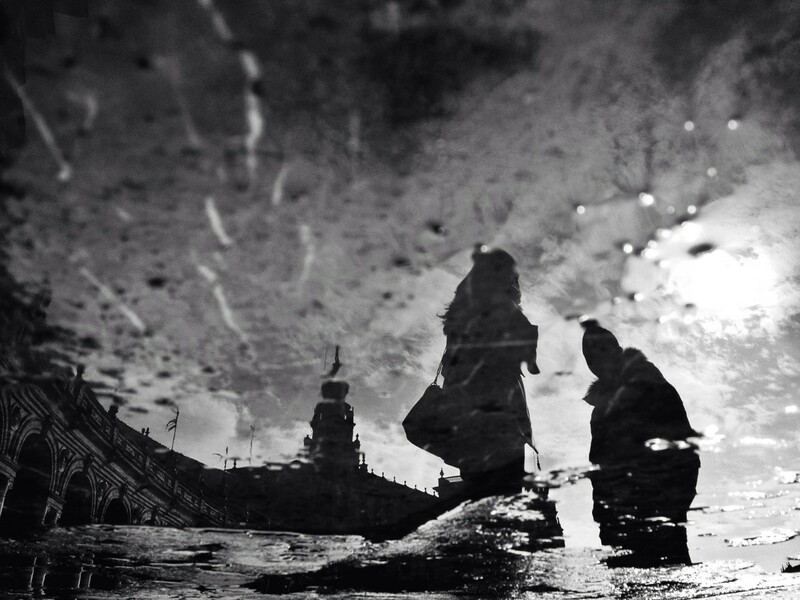 Luis Rodriguez's mobile photography often focuses on the reflections of his city. All images by Luis Rodriguez. Luis Rodriguez uses his mobile photography to reflect on the world around him. An architect living in Madrid, Rodriguez captures the essence of his surroundings with his iPhone 4S. His work has been recognized with two Honorable Mentions in this year’s Mobile Photography Awards, and also featured in Spanish online media. Rodriguez primarily shoots with the iPhone's native camera application but will occasionally use ProCamera or Camera + when he needs to choose separate focus and exposure points. His next stop is Snapseed for edits and then FilterStorm or FrontView for special edits. "I love reflections on any surface: cars, buses, buildings and puddles," Rodriguez told Connect. "I love to watch the city and its urban life reflected on all these surfaces. I do also love to turn upside down pics [sic] of reflections on puddles, entering, thus, into a totally new and magical world." This shot of the Royal Academy of History reflected in a puddle won honorable mention in the Archetecture category of the Mobile Photo Award and has been featured as an Editor's Choice on 500px. "To see an iphone shot pic among DSLR shot and wonderful pics is something very important to me." This shot is one of Rodriguez's favorite reflection photos. 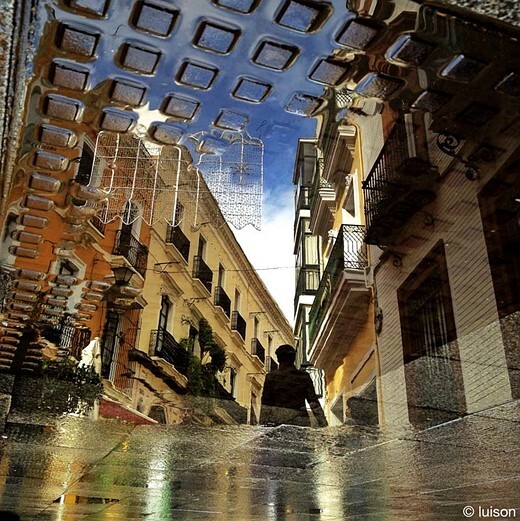 "I was wandering around Sevilla with my youngest daughter, on my way to have some beers with a couple of friends, saw the puddle, told my daughter not to step into it, waited a few seconds for a person to step into the screen and shot the pic. It took me not longer than 10 seconds. 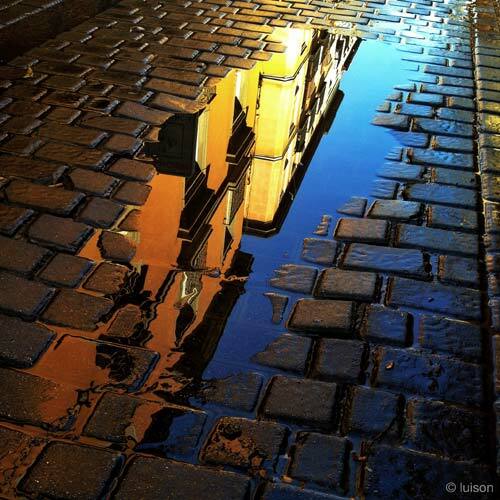 I love to see the metallic texture of the pavement melting with the reflection of the city. There's no trick on this picture, it's just a reflection on a puddle turned upside down." This shot won Rodriguez an Honorable Mention in the Performing Arts category in the Mobile Photography Awards. "It was a quick shot of wandering musicians playing music on the streets of Madrid at night. I loved the 'harmony' between the beauty of music and the beauty of the model on the showcase of an important mall." For Rodriguez, mobile photography has become a major artistic outlet. "Apart from my family, mobile photography is nowadays the most important thing to me," he said. "The critical economic situation in my country allows me to have a lot of free time that I spend shooting, editing, writing on my blog, on my Facebook fan page, and so on. "Friends and family have already got used to me walking down the streets and stopping by to shoot some pics, or to sit at home and start editing. But I must admit it was very hard at the beginning for them, and for me too. I shoot, edit, work on my pics and my blog daily, almost all the time. It's no longer a hobby, but rather a passion that I hope will turn someday into a new way of living." Rodriguez's third solo exhibition, "The City Reflected," is ongoing in Peñafiel, Valladolid, Spain. You can also see more of his images on EyeEm. Bruce McL wrote: "On a phone you can edit and publish as you are photographing. No other equipment is required. That ability is what makes using a phone different from using traditional cameras." So people want to be acknowledged as Fine Art Photographers, but they are too lazy to copy the photos from the camera to a computer. OK.
Hi Sigala, oh i need to have a computer to be a fine art photographer! That's where i'm going wrong. Just wanted to say those are some really great shots and nicely processed but I notice on his website that he does a lot of clean line shots & this particularly exacerbates the problems with the mobile camera. Some of the angled shots of streets have really bad clipping and noise even in the lower res variant. Looking at his style of shooting, I would really recommend moving up to a micro 4/3 or Nex. Some of the shots would be excellent unencumbered by the flaws of the mobile tech. Perhaps when the economy picks up a bit but good work nonetheless. Keep it up. can someone explain me what's the difference between mobile photography and photography? and why don't people say DSLR photography, compact camera photography, m4/3 photography, laptop photography, PC USB webcam photography, etc.? On a phone you can edit and publish as you are photographing. No other equipment is required. That ability is what makes using a phone different from using traditional cameras. well, that didn't explain why then nobody calls photography that is done with a DSLR and edited on a laptop and then published DSLR laptop photography or photography that is done with compact cameras and is edited on PCs or MACS compact camera pc/mac photography. nobody also calls photography that is not edited at all non-edited photography or nobody calls photography that is taken with film cameras and edited in a darkroom film darkroom photography or something. so why the exception here to point out what was the technical equipment used? plus, what you just said is not even true entirely. A DSLR camera can have a wi-fi connection which would allow you to do the same thing. so, that's mobile photography too? not to mention that there are cameras out there which are no phones with which you can take pictures in the same way as with phones. also tablets are not phones but you can take a picture, edit it and publish it without the need of other equipement. The mobile phone brings new people into photography. It's a big change. A name is just something that makes it easier to discuss changes and trends in photography. "A DSLR camera can have a wi-fi connection ...?" If you edit and publish to the Internet directly from the screen of a DSLR, that's mobile photography. "… there are cameras out there which are no phones with which you can take pictures in the same way as with phones. also tablets ..."
Yes again, if that's the way you use the device. More and more cameras are being sold with the capability of doing mobile photography, even if they are not primarily used that way. "… nobody calls photography that is taken with film cameras and edited in a darkroom film darkroom photography ..."
If you want people under 40 to understand what you are talking about, the term "traditional film photography" would be good to use. if you saw these same pictures and there was no notice that these were taken with a phone would you know they were taken with a phone? NO! so, how is it different from any photography out there? why does it suddenly make a difference what one uses to take pictures? photography is 150 + years old and it still serves the same purpose and it still does the same thing and implies the same notions. it's not a new kind of photography it's just photography that is taken with a specific tool. calling it mobile or whatever else is like calling air in china chinese air and air in france french air. it's kind of moronic especially if you are not consistent. so, if you want to call phone photography mobile or whatever then do the same with other photography as well based on the equipment, technology, techniques etc. that it was used to take it. so, laptop photography, tablet photography, DSLR photography, compact camera photography, mirrorless photography, etc. but nobody does that. the point is that "mobile" photography hasn't changed anything about the photograph. it's not like if you take a photograph with your phone it means something else as if you took it with another camera. it's not like different rules apply to it etc. it's not like a phone photography can be good or bad based on some different criteria than what we use otherwise in photography. it's not like a photograph is better, more special, different if you take with with a phone compared to something else. from the point of the final product (photograph) there is not difference at all. so, why do so many people have in mind as if there was? why is it necessary to point out it's a phone photograph? why does this even matter from the point of the final image? it's a pointless and unnecessary word that of course no one will use 5 years from now because then all photography will be "mobile" and we will all be back to calling photography just photography. "why does it suddenly make a difference what one uses to take pictures?" Wrong. Photographers have discussed specific tools and techniques for a long time. There is nothing new about that. "if you want to call phone photography mobile or whatever then do the same with other photography." Wrong again. That's not how language works. Things that are topical and popular get names, and things of equal taxonomic value that nobody talks about do not. "From the point of the final product (photograph) there is not difference at all … it's a pointless and unnecessary word that of course no one will use 5 years from now." Billions of people are learning photography for the first time. The tool that they are using, the cell phone, is relatively new. People who frequent this web site find this interesting, and are interested in discussing it. They are curious about how this photography gets from brand new a few years ago to ubiquitous in the next few years. If you are not interested in discussing the most significant recent development in photography, If you think people who are interested in doing so are morons, I suggest you stop paying attention to this web site. You have nothing useful to add to the discussion here. "Stop it, stop it, stop it!!!" is not useful. The answer you are looking for is snobism. "Look - I can take better pictures with my phone than you with your DSLR!" It is just a new phase the "progressives" are going through. Simply ignore it. Once it runs out of being "a new thing", it'll die out for the lack of actual substance. Actually you have a good point. It's all just photography. When we tag "mobile" onto photography, are we really doing this just so that we can preface the output by stating "let's just ignore quality issues and focus on the art"? The real question is, with the tech already available, why can't we have both quality and art? Why is it necessary to split into this divide unless to pre-emptively state "there will be problems, just ignore those and concentrate on the picture". It's all just photography and one has to wonder about the artificial split. Is it meant to split the "pros" from (and excuse) the more "amateur"? Because clearly there are very good photographers in this space. "Wrong. Photographers have discussed specific tools and techniques for a long time. There is nothing new about that." that's my point. the question is how did all that change photography? the answer is: it didn't. when 35mm came out I suppose everyone was calling that "35mm photography". who does that anymore? no one because it's pointless. when digital cameras came out everyone was calling that "digital photography". who does that anymore? no one, because it's pointless. it's still just photography. but some people never learn so yet again we "invented" something that was invented 150 years ago "mobile photography". "Wrong again. That's not how language works. Things that are topical and popular get names, and things of equal taxonomic value that nobody talks about do not." that's exactly my point. this "mobile photography" thing is a pointless trend invented by people who don't really understand that a "mobile phone" doesn't take anything more nor anything less than a photograph. "Billions of people are learning photography for the first time. The tool that they are using, the cell phone, is relatively new. People who frequent this web site find this interesting, and are interested in discussing it. They are curious about how this photography gets from brand new a few years ago to ubiquitous in the next few years." LOL... you said it! they are learning photography!!! not mobile photography or whatever. the tool doesn't change photography and its essence it only chances the way photography is done, not photography itself in the same way as you are not frying something else than eggs if instead of one tool you use another. that's the point. there are no different types of photography, there are just different tools and ways to do photography. so calling it mobile or whatever is missing the point. "If you are not interested in discussing the most significant recent development in photography, If you think people who are interested in doing so are morons, I suggest you stop paying attention to this web site. You have nothing useful to add to the discussion here. "Stop it, stop it, stop it!!!" is not useful." I use my tablet, phones, webcameras, whatever to take pictures too. I am just not delusional that what I am doing with these tools is something different than photography. so, I don't say hey, I am going to do some mobile photography today. I don't say I am going to do some tablet photography today. I just say I am going to do some photography. and when I look at pictures I don't wonder if they were taken with phones or not or make distinction between them if they were but they are all photographs. so, just cut with these mass nonsense. it's photography. "The answer you are looking for is snobism. "Look - I can take better pictures with my phone than you with your DSLR!" It is just a new phase the "progressives" are going through. Simply ignore it. Once it runs out of being "a new thing", it'll die out for the lack of actual substance." yes, that's my point. it just irritates me because it's stupid. photography has been photography for 150 years and no tool has ever changed it and never really will. the problem is that pictures are gaining both positive and negative attention from people just because they were taken with a phone as if it was any different if they were taken with a different tool. so, the question is would these pictures here be any less good, interesting etc. if they were not taken as "mobile photographs"? I guess not, but it seems that according to some mass hysteria they actually are. Yep, they put the word "mobile" their to make them stand out from the rest of the photography world in a sort of "hey look at me!" way. "It's all just photography and one has to wonder about the artificial split. Is it meant to split the "pros" from (and excuse) the more "amateur"? Because clearly there are very good photographers in this space." exactly. the result we get is that it seems like taking pictures with a mobile phone is something so different that requires some different standards, a different way to look at it. like it's not good enough to be called photography so it has to be called something different to point out it belongs to some different league. it's basically the same thing that happened when digital cameras started to appear. also then you had photography and you had "digital photography" which was supposed to be something less than photography. something not as serious, not as photography. "there are just different tools and ways to do photography." That is the craft part of photography. Different tools require different techniques. They also make it easier or more difficult to achieve a particular result. "... calling it mobile or whatever is missing the point." No, calling it mobile is specifying a specific craft and set of techniques that are of interest. It's not a sin or crime to discuss craft and technique. That is the primary reason this website exists, to discuss craft and technique. "No, calling it mobile is specifying a specific craft and set of techniques that are of interest." LOL, what specific craft and technique are you talking about?! and of course we can discuss using different tools in photography but lets not be fooled that by doing so we are talking about different kinds of photography. it's still photography. you can use a camera with one hand, two hands, put it on a tripod, monopod, hold it vertically, horizontally, you can use viewfinder, LCD screen, you can set it manually, use touchscreen etc. these are all different techniques which don't mean different kind of photography. "mobile" photography is just photography. it's not any better not worse, not any more interesting as an output or less than any "other" photography one can define in this way. We tag it mobile to people can find it and learn how to take better shots on mobile devices. No different to lomo, film, photoshop blogs. This discussion is not useless, it just did not turn out as flattering as you expected. I don't know of any great photographer who was proud of taking photos with inferior equipment. If you want to be a real photographer, stop pretending that you are so good that you can take pictures even without a real camera. Absentaneous is wrong, mobile photography is not just photography, but a dedicated attack of the "progressives" to diminish and destroy the culture of photography. While you are enjoying your moment in the spotlight, you should understand that you were simply picked by the "progressives" as a tool of their destructive agenda. The Royal Academy of History reflection is beautiful! Thanks to the whole team, and thank you, Lauren, for thinking about me, and for this great article about my work as mobile photographer! "This shot, taken in Scotland, won Rodriguez an Honorable Mention in the Performing Arts category in the Mobile Photography Awards. "It was a quick shot of wandering musicians playing music on the streets of Madrid at night. "" Is Madrid in Scotland now?